If you ever need proof of how utterly effective special effects makeup can be in horror, you need look no further than these cosplayers. They take terrifying characters and concepts away from the realm of movies and into the real world. Sometimes cosplay is inadvertently horrifying. Sometimes it stretches the line between cute and strange. And some horror-themed cosplay is gorgeous rather than frightening. We've collected some of the costumes and makeup designs that have made us shiver. Share your own spooky or gruesome favorites in the comments. 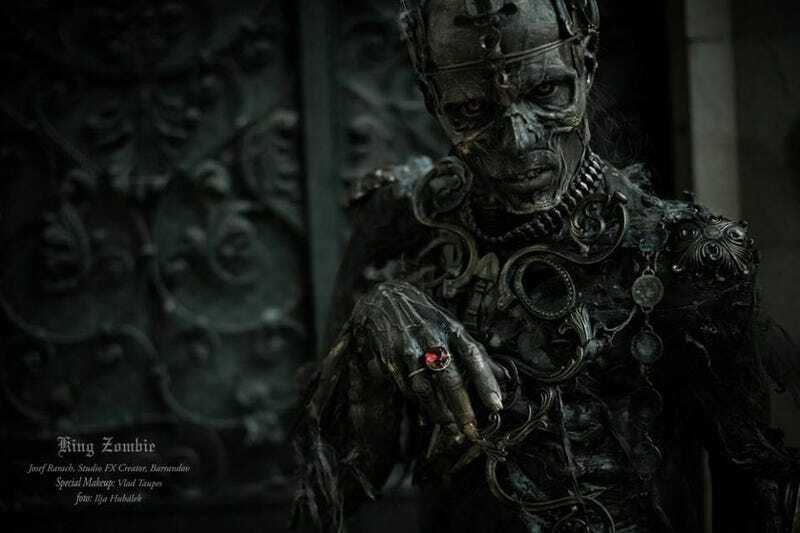 Up top is makeup artist and performer Josef Rarach wearing the King Zombie costume designed by special effects makeup artist Vlad Taupes—photo by Ilja Hubálek. The character looks amazing in action, too. You can see more pictures of him here. Sometimes things are particularly nightmarish because of their context. Such is the case with the real-life Bert and Ernie, which show us how these two favorite Sesame Street Muppets would look as real people. There's a reason this made our list of the Best Cosplay of 2012; we couldn't get this image out of our heads, no matter how hard we tried. Spotted at Dragon*Con by redditor ProbableCause. The Clickers from The Last of Us are just plain shudder-inducing with their exploding fungus faces. It's no surprise that the cosplay is equally gruesome, whether in this form—worn by model Emma Franks, designed by makeup artist Jon Wilks, and photographed by Adrian—or with these nightmarish beauties. Here's a suit we'd really love to see in action. Judge Dredd's foe Judge Death comes to undead life thanks to HeadHunter Store, which made the suit. Peter Olsson came up with the idea and is wearing the suit. The photo is by Constantine Morte. This is one of those costumes where the concept is as wonderful as the execution. This horrific Halloween makeup by Sandra Holmbom makes it look like the wearer has made a mask out of her own skin. Brr. Attending a masquerade ball? Consider wearing your own face! And while some makesup artists go for gruesome realism, others take a more illustration-inspired approach when creating unnerving designs. Alexys Fleming, a.k.a. MadeYewLook, frequently falls into the latter category. She accomplishes some freaky looks with just makeup and the occasional accessory—no prosthetics and no costumes. There are scarier Scarecrows and there are less frightening Scarecrows, but Weasel Cosplay's take on Arkham Asylum's Jonathan Crane, with its sunken eyes and excellently stitched mouth is particularly fearsome. Photo by kashikosa. Video games really do inspire some truly grotesque cosplay. This Resident Evil Crimson Head makeup was designed and applied by MartyrsDeath, worn by Sh3ikha, and photographed by Ann-INC.
Cabin in the Woods' Sugarplum Fairy—the ballerina dentata—is one of those designs that's so horrifying, that it's inherently scary to see it in cosplay form. This one is by MissPyramidHead4, who, as you imagine, also has some great Silent Hill cosplay in her gallery. The model is her sister. And this blank-faced Rose is another piece of cosplay that's great simply because it evokes a terrifying moment, from the Doctor Who episode "The Idiot's Lantern." Posted by Alcblueyes on the Doctor Who Cosplay Livejournal group. Forget the sexier versions of Silent Hill's spooky nurses. This is the nurse we wouldn't want to run into on a foggy night. The nurse is Doom-In-A-SKORT. Pyramid Head is Ashgroovy. The photo is by Judith Stephens. You can see more on Flickr. And this now-famous zipper face is proof that a truly horrifying look doesn't have to complicated. A bit of creative styling can go a long way. Posted by Redditor YouHadMeAtBacon.